Linguist K. David Harrison began his lecture Monday by teaching the Amphitheater audience the Koro greeting kaplaye, a word meaning “it is good” and “thank you.” He followed with a sobering fact: All speakers of the Koro language of India could fit in the first few rows of the Amphitheater. Harrison’s morning lecture kicked off the Week Six theme, “Vanishing,” on the topic of endangered languages. Harrison is an associate professor of linguistics at Swarthmore College and activist for the preservation of endangered languages. He is the author of the book The Last Speakers: The Quest to Save the World’s Most Endangered Languages. There are more than 7,100 internationally recognized languages, not including dialects. Half of them are endangered, which means they may go extinct in the 21st century. The list only includes the languages that are known, Harrison said. 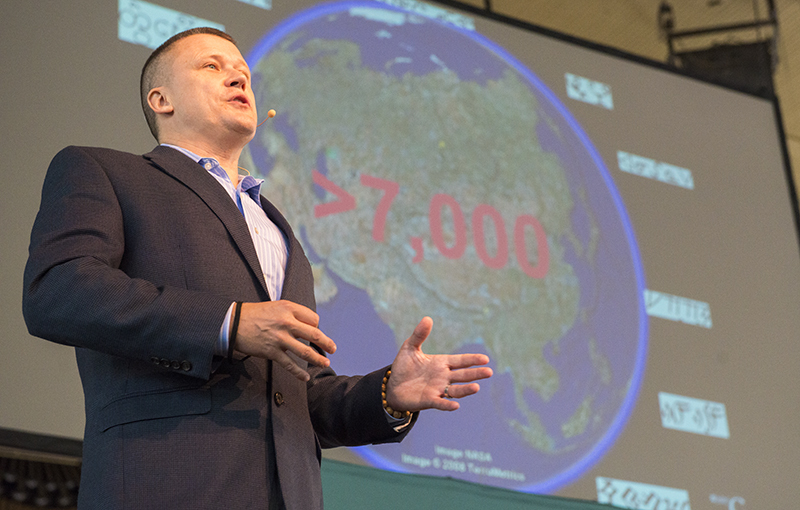 During his lecture, he analyzed where these endangered languages are concentrated, why they are in danger and what is being done to save them. Eighty-five languages are spoken by a little more than 70 percent of the human population. Middle-level languages number over 3,000 and are spoken by 21.1 percent. Approximately 3,512 languages are spoken by a mere 0.1 percent of the global population. That 0.1 percent is the source of passion behind Harrison’s work. “We don’t have a record of 90 percent of languages,” he said. The interest in endangered languages goes beyond the academic, Harrison said. For instance, the Kallawaya people of Bolivia are specialists in previously unknown forms of medicinal plants. Their knowledge base of more than 1,200 documented and undocumented plant species is reflected in their language. “It’s an example of the very specialized knowledge you can only find in very small regions,” he said. “Language hotspot” is Harrison’s vernacular for areas of highly concentrated language diversity. Europe has 164 languages, 18 language families and 0.11 percent language diversity. In Bolivia, one can find 37 languages but an equal number of language families and 0.49 percent language diversity. While in Paraguay, itself a language hotspot, Harrison’s team met the 100-year-old Mr. Bosso. In his lifetime, Bosso personally witnessed a transition from an isolated hunter-gatherer lifestyle to living in a village with satellite TV, cellphones and foreign scientists such as Harrison interviewing him with microphones and cameras. “A conversation with Mr. Bosso is the closest thing I’ve ever experienced to time travel,” Harrison said. Many of these aboriginal communities are quite open to technology, Harrison said. They see it as an opportunity to cross into a larger, broader global community. Harrison took the audience on a virtual tour of four other language hotspots: Siberia, Papua New Guinea, India and Oregon. In the hills of Siberia, Harrison lived among the nomadic Tuva and learned their language, Tuvan. He learned very quickly that he had no useful skills for nomadic living. His first job? Yak manure collection. It turns out yak manure is their source of fuel to cook food and heat tea. Thus, they have over 100 different words for manure and its different states, Harrison said. Their internalized views of the body and the environment are also contained within their language. For example, Harrison showed a video of a young boy performing a love song in Tuvan throat-singing. One lyric was “my liver aches,” meant to relate the feeling of unrequited love. While Western culture has its own metaphor for the source of emotion — the heart — for Tuvans, it is the liver. “Different languages can have metaphorical systems that conceptualize the world very differently,” he said. They also conceptualize time and space differently than other languages by use of body metaphors. The word for nose is similar to their past tense while the word for back is similar to their future tense. Harrison said this is because, for Tuvans, the past is always in front of them, while the future is behind and unknowable, a flip on the traditional Western context of time. Because of that, in the second case study of Panau, Harrison conducted a “reverse expedition”: taking a resident, named Rudolf Raward, from the Papua New Guinea village, to the U.S. to help build a digital talking dictionary. The first book written in the Panau language was Raward’s autobiography, Ngau Rudolph, which he took back to his village. “His community has literacy now, thanks to him,” he said. Harrison learned from his earlier work living among people such as the Tuvan nomads that he could never fully internalize the intricacies of endangered languages. It was better and more efficient to educate native linguists with the tools to do it themselves, he said. Panau is a language with fewer than 500 speakers, according to Harrison. In the communities where it is spoken, children under 10 no longer speak it, a phenomenon known as “language shift.” He likened it to speaking another language socially despite growing up in a household where a native language is spoken. Their language reflects not only a different concept of direction, but reveals otherwise unknown history, Harrison said. For example, in Panau, their words for east and west correlate to “toward the sea” and “away from the sea.” But there are also almost-identical words for going up or down elevation. This is because, in the distant past, they quite possibly lived on and migrated from a volcanic island. Today, there is one fluent speaker of Siletz. His name is Alfred “Bud” Lane III. Harrison and his colleagues were able to work with him to record over 1,400 Siletz words to produce a talking dictionary for his tribe. “A single speaker can undertake revitalization,” Harrison said. It also raised the point of linguistic ownership — a notion not often thought of regarding common languages like English. In this case, the Siletz language is the intellectual property of the Siletz tribe, and it was their prerogative whether or not to share with others. For five years after the dictionary was constructed, it was password-protected. But recently, the tribal council decided to open the dictionary to world. Lastly, Harrison brought forth the Koro language. Previously considered a mere dialect in the region, Harrison and his colleagues easily discovered that Koro was radically different from its cousin, Hruso. It speaks to the misunderstanding of the blurry line between language and dialect, Harrison said. “The two supposed ‘dialects’ are as different as Japanese and English,” he said. On the forefront of preserving these languages are people Harrison termed “language warriors.” They are the ones who are making choices to speak their native, endangered tongues to keep them alive and pass them on. Some, like Raward, bring literacy to oral traditions, while others create music in these languages to make them palatable to others. Q: Very curious — in terms of your looking at these 1 percent of languages, have you encountered a language within a culture with no cynicism and no snark? A: You have to be a fairly sophisticated user of a language to detect sarcasm, so I really couldn’t say. I know that humor in different cultures is very different. What counts as funny is very different. And this is an area that needs study. I just have to say, I don’t know the answer. At the level that I work at for language, it’s probably not a high enough level to detect if someone is being cynical. Q: How do you conduct interviews in these remote places where no one else in the world speaks the language? How do you approach those? A: Well, we have a couple techniques, very basic techniques, that I teach my linguistics students. If you have a common language, that’s great — you can use English or Hindi or Russian or whatever common global language you have, perhaps with an interpreter although there are very severe limitations on using an interpreter because there is no one-to-one mapping between languages. If you are just sitting down with a speaker, you can point to objects. You might get the word for finger when you thought you were getting the word for tree. That has happened a lot in the history of linguistics. But through that very simple, painstaking method of pointing at things, you begin to build up a basic word list of physical thing, and then you can start combining those and build up from there. So I always try and learn a little of that language that I’m studying — even if I’m starting with that very basic kind of thing. Q: By the way, you referred to the Tuvan vocal throat singing. We indeed had Tuvan vocal throat singers here in the ‘90s. That’s one of the early marks that Marty Merkley, who’s now retiring, made on this place. Very creative guy. Would you comment on the value and place of digital tools in documenting language and personal interactive tools as well. A: Digital tools are amazing, and they’ve become so small and portable in recent years. What used to require a sound booth and all kinds of equipment I can now carry in my pocket. I can now put gigabytes of recordings onto a flash drive. But I want to point out that digital data is very fragile. And in fact, it’s less durable than every media that preceded it. So if you think about paper and papyrus and clay tablets and stone, those things are all around. We have no idea if our digital data will still be here in 10 years. It’s important to do digital documentation, but print books are also important. Q: Let me try to combine a couple of these questions. Is there an evolutionary process, where you can identify the age of these languages and their role in human language development? Is your work preserving cultural relics? And off of that question — what is the youngest language, and how much do we know about the age of language, and are new languages being created? A: Yes, lots of questions hidden in there. Languages — I often get asked what is the oldest language, and we don’t know that because languages are constantly evolving, and their rate of change is not constant. So some languages can change fairly quickly. Other languages that are spoken by large communities change a little more slowly, but they nonetheless change. So we don’t have a method for dating languages based on changes. We can look back at the language family tree, and we can figure out approximately when two communities split and went their separate ways, and you give them 100 years, and you get a difference on the order of British and American English. You give them 1,000 years, you have a difference on the order of maybe Italian and Portuguese. So you’ve lost mutual comprehension. Beyond that 1,000 years, it gets much more difficult to untangle the age and when they diverged. As far as the newest language, the conditions don’t really exist in the world right now that existed in the past to allow new languages to emerge much. It happens occasionally. It happens with Creole languages, but the conditions that used to prevail on the planet, which is when you had many fragmented, small human populations that went off their separate ways, those were the ideal conditions for linguistic diversity to arise. So we no longer have that, and as a result, we can never match the rate of language extinction with the pace of new language creation. But we can expect to get some new languages over time. Q: You described the positives of inserting yourself and your colleagues into remote societies to help understand and preserve their language. Can you describe what is lost to these societies in the course of your work? A: There are a lot of ethical issues in working with societies like this. We only work in communities where they have invited us to be there, and we go in and spend a lot of time explaining ourselves —this is what we would like to do, this is what we would like to record, do we have your consent and permission. Maybe part of what’s lost is you can become over reliant on digital technology. So these languages depend on social face-to-face transmission. If people think the language is safe because it’s been recorded and archived somewhere, that can be a pitfall because they might stop using it. Other than that, I’ve generally positive experiences, and as I said, we only work, for ethical reasons, in communities where they understand what we are doing and they have invited us to be there. Q: You mentioned that circumstances can influence the words used in different languages. Other languages use tonality or clicks. What other sources of meaning are we missing as we lose languages? A: Well, those are two great examples. Click languages, and there’s about three dozen of them, if they didn’t exist, we would never have imagined that they existed. The same for tone languages, although there are hundreds of tone languages. There’s something that I study called vowel harmony, which is a really interesting sound pattern on how you use vowels. Languages are self-organizing systems, so they have peculiarity and complexity, and they go off on tangents of development. They certainly influence their speakers, but their speakers don’t determine the structure of the language. It’s a self-evolving system, so you can get all kinds of strange complexity that the speakers know implicitly but that they’re not able to explain. So I would just say, we don’t know what the outer limits of linguistic complexity are. There may be things out there as strange and interesting as click languages or tonal languages that we haven’t come across because we’ve only documented maybe 15 to 20 percent of the world’s languages. Q: Having said that, how many language families are there in your count? A: That is very, very contested. So if there are 7,000 some languages, there are probably on the order of 250 to 300 language families, and then there are a number of what we call “language isolates,” which are languages like Basque or Japanese, that are so different that there is nothing else like them. They don’t appear to belong to any particular family. So a family of one. Q: Whatever happened to the Esperanto movement? A: Earlier in my career, I would have said I don’t care. Because Esperanto is an invented language — it’s a contrived language, if you will. It’s a mish-mash. I mean, Ludwik Zamenhof, who invented Esperanto, was a very talented person, and he knew a lot of European languages, so he made this kind of hybrid language that was supposed to facilitate world peace and universal communication. It didn’t do that, but it became something for language hobbyists, and apparently there are Esperanto conventions. And this is where I became interested — I was invited to M.I.T. to give a talk to the Esperanto Club, and they told me there are people who met each other at Esperanto conventions and had children, got married, had children, and raised their children speaking only Esperanto. I am very eager to meet one of these children, because if that’s the case, then Esperanto has transitioned from being an invented language to being a real human language, and the children who grew up learning it will add their own complexity and structure to it. So Esperanto may now be a real language, in which case I’m interested in it. Q: Are Western linguists able to ask the right cultural question? Can a Western linguist fully comprehend the language or languages of other cultures? A: No, and that’s why, in recent years, I’ve focused much less of my time on me trying to analyze something and much more of my time and resources on training indigenous linguists in these communities and giving them the equipment they need. They can do this work much more efficiently. They are personally invested in the survival of their language, and they are at a level of understanding I could never achieve. So I actually recognize the limitations of what an outsider can do in trying to understand a language. Q: Of the more than 3,000 languages spoken by the 21 percent that you cited earlier, how many are moving towards extinction? A: About half of those, and the other half are just stable. I tried to figure this out by going to a community. I try to asses where’s the language being spoken. Are people of all ages speaking it? Are they using it in all kinds of daily situations? So we have some tools, some scientific tools for measuring the vitality of language. So about half, about half of the world’s languages are endangered. And I should add, there are a few languages in the very small size that are completely stable and are not endangered. So size does not correlate with endangered, necessarily. Q: This question has to do with music — if that is an aspect of your work. Are you also studying or recording the traditional music? I was struck by how you just made a case for the blues being a fundamental aspect of all music. It’s important. A: I love music, but I’m not qualified or trained in this area. There are a lot of skilled ethnomusicologists, and I have occasionally been able to do joint expeditions with them, and they have all the skills and techniques for understanding musical traditions, which, many of them would point out, are significantly endangered as well. So we’re not just losing languages, we’re losing mathematical counting systems. We’re losing musical systems. We’re losing all kinds of things. There is a lot of fascinating material here. I hope you will allow me to comment further on the planned language Esperanto. Esperanto hasn’t yet gained the recognition it deserves, but, all things considered, it has actually done amazingly well. In 128 years, it has managed to grow from a drawing-board project with just one speaker in one country to a complete and living natural language with probably a couple of million speakers in over 120 countries and a rich literature and cosmopolitan culture, with little or no official backing and even bouts of persecution. It hasn’t taken the world by storm – yet – but it’s slowly but surely moving in that direction, with the Internet giving it a significant boost in recent years. About 80,000 people have signed on for the new (beta) Duolingo Esperanto course in the first few weeks. https://www.youtube.com/watch?v=UzDS2WyemBI It was never planned that way, but it happened, and I have met about a dozen native speakers over the years. Thanks for an interesting article. Your readers may be interested to know that the World Esperanto Association now enjoys consultative relations with the United Nations and is using its position to speak out in favour of the need to protect endangered languages.